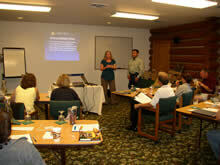 This course is approved by the Idaho Peace Officer Standards and Training. To receive credit for the Online Law Enforcement Spanish course, you must complete all tests with a score of 70% or higher and complete at least 24 hours online in the program. Save a copy of your certificate of completion to receive credit for this course. You may print your certificate as soon as you complete the course requirements.